For the first time in several days I woke up feeling completely rested, and I knew that the short days and extra sleep had finally done the trick. Not wanting to ruin a good thing, nor to rush my time through Yellowstone, I decided to have another slow morning and short ride to my next campsite. Over my morning coffee and paper I read that the heat wave that had been gripping the West had just moved on to share some love with the East. I had known that the temperatures I was riding in were unseasonably warm, but I hadn't known that they were breaking records that had been set in the 1930's. You'll recall that on the 13th I had started my morning late only to immediately have Mark and Emily behind me on their purple tandem. Well it appears that once again the forces of serendipity are encouraging us to find each other, as I was no more than five minutes out of Colter Bay when I spotted them again in my rear view mirror. They had rendezvoused with their friends, Barbara and Robert, and started riding down from Togwotee pass earlier this morning. Because they had skipped the entire sidetrip to Jackson, they had made up the day I had gotten ahead of them. Since the mothership crew had been riding for hours more than me, when we all reached Lewis Lake they announced they were at their stopping point for the afternoon. Joining them would have meant my quitting after only 30 miles, so despite their invitation I kept going down the road to the large campgrounds at Grant Village. I entered Yellowstone National Park through the southern entrance, and spent most of the day riding through forests which were burned in the fires of 1988. The gray husks of trees scorched fourteen years ago still stand like silent sentries over the young pines that are now growing to take their place. Despite the loss of over one-third of the park's 2.2 million forested acres, nature is demonstrating that the cycle of fire and regrowth is a powerful thing. When I arrived at Grant Village I joined the long line of people already queued waiting for a campsite. The line was barely crawling forward and I could hear with dismay as the number of unreserved tent sites fell slowly from five. I knew that the gentleman in line immediately ahead of me had taken the last tent site, so it wasn't with great hope that I approached the window to ask about a place to camp for the night. To my relief, I was told by the ranger that "we always have room for bikers, even if you have to sleep in my front yard", and was signed up for one of the small sites they reserve for hikers and cyclists and those whom it would be too painful to simply send twenty more miles down the road. In a nearby campsite to my own I met a group of guides who were preparing camp for a group of 45 cyclists. 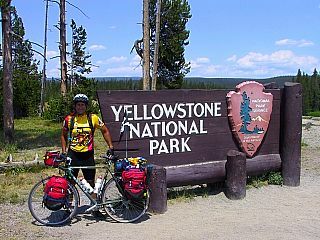 This wasn't a group crossing the country, but simply vacationers who had signed up for a guided bicycle tour of Grand Teton and Yellowstone parks. As I was talking to the guides about my trip so far, I pointed out that "I'm almost done, I only have 1,300 miles left." It wasn't until later that the surreal ness of calling 1,300 miles "only" struck me, but being on the road so this far has begun to warp my sense of what is normal. I was only recently told about you website. So I've spent several days of catching up. One thing I noticed is how remarkable the photos are. I don't know how much time you spend in selecting them, but they really add the the journal entry and make your whole site something wonder to read. (I'm just letting you know I appreciate the effort you are putting in). As I am about to leave on a vacation of my own, I know I'll have more catching up to do when I return. Enjoy your ride. Today, my 4 year old son, pushed his tricycle all the way down Barrett Dr. We stopped when 5 houses down, a cat ran out to meet us. 10 houses down, we reached the end of the road. Later that minute, we had to turn and work our way back to our house. We paused to view some aunts and a stink bug. After squishing an aunt or two and a stern lecture from dad telling him to leave bugs alone, we moved on to 1604 Barrett Dr. Placerville Ca. Where we reside. Thanks Nick, I just wanted to share the life of a father after work and compare the two. Keep it up! Your son's ride sounds wonderful. Maybe after I hit Oregon I should come down and see if I can handle your driveway. No promise to stay away from the bugs though! Nick one question. Since when have any house members not had a warped sense of what was normal? 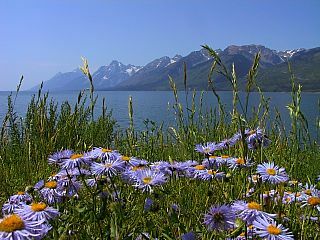 Wyoming pictures are great, the flowers are cool. Hope to see you for Paul's wedding and 2dlb public bafoonery.